Timeless, poetic and wise, the articles recaptured in this remarkable volume beg to be read again and again, a much for their spirit as for their practicality. This collection defines our roots, yet in its timelessness points the way to the road ahead for the theory and practice of organization development. From the very first issue to the present, the OD Practitioner has been the premier publication of the organization development profession. Its articles defined organization development and envisioned its future. These articles are now considered classics. And for the first time, they are assembled here, all in one volume, for practitioners and aspirants to the field to study, learn from, and enjoy again and again. A wealth of innovative thinking that will continue to impact the OD profession for years to come. To discover where you're going, it helps to first know where you've been. And in the world of organization development, the surest road map is the OD Practitioner. * Margaret Wheatley . . . and many more! 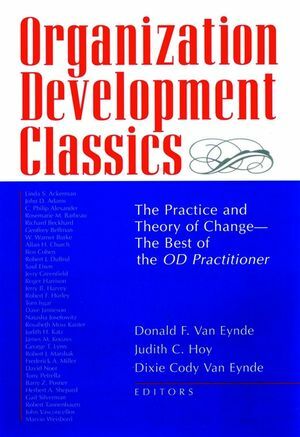 Since its debut in 1968, the OD Practitioner has been the premier forum in which the field's founders, innovators, and working professionals have shared their ideas, values, and experiences regarding the practice of a dynamic discipline few can accurately define. With every issue published, the profession chronicles its history, refines its standards, and imagines its future. * Leadership ideas...and much more! In these pages, readers will gain a historical perspective on both the theory and work of organization development that will greatly inform their practice. They will discover reports and research that moved the field ahead. They will gain an appreciation of the foresight the field's founders and innovators had regarding OD's possibilities and usefulness. And they will benefit from a wealth of innovative thinking as relevant today as when originally published?thinking that will continue to impact the practice of organization development for many years to come. JUDITH C. HOY is president of her own firm, Learning Systems, through which she consults with a number of organizations, including NYNEX, AT&T, Con Edison, and the Girl Scouts. She is also an elected member and former chair of the board of trustees of the Organization Development Network. DONALD F. VAN EYNDE and DIXIE CODY VAN EYNDE worked as coeditors of the Organization Development Practitioner from 1984 to 1988. Dixie was a member of the Organization Development Network's board of trustees during that same time, and Donald also served on the board from 1984 to 1996. Together they have raised three children while maintaining active professional lives.